Podomatic, a podcast publishing and hosting platform, has partnered with Weebly, a website builder. Together, they will help podcasters create brilliant podcasts and websites that work across any device. To help podcasters succeed, Podomatic is offering professional website building capabilities. Now, Podomatic top level accounts can create a high quality website and store that works brilliantly across any device. This new feature is included in the price of the hosting and publishing service on top level accounts and provided at no additional cost. It allows code-free website editing and building, as well as provides an e-commerce platform. Automatic sync between your podcast and your website. Podomatic Weebly apps are tailor made for your podcast. Themes created exclusively for Podomatic podcasters. Easy management of your entire podcast. One account to rule them all! Now manage your podcast and website under one Podomatic account. At the time I am writing this, Podomatic is offering their most popular podcasting plan at 75% off the usual price. For a limited time, you can get their PRO plan for only $2.50 a month. (Usually, the price is $8.32 per month). Podomatic helps podcasters to reach an audience with free podcasts, customizable embedded players, and promotional tools. 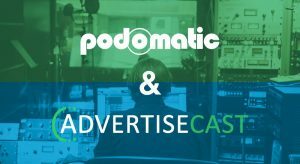 Podomatic has partnered with AdvertiseCast, which makes it easier for advertisers to buy ad spots from podcasters online in one centralized marketplace. AdvertiseCast is the premiere online advertising marketplace that connects advertisers with podcasters. Their system makes it easy for you to get sponsored, and they take care of everything from finding advertisers, ad buying, payouts, and more. Here’s how this partnership works. First, “dig deep inside your soul and make a podcast” (says Podomatic). Next, join Podomatic and add your podcast listing to the AdvertiseCast marketplace for free. Choose the ad campaigns that best fit your podcast. Describe your podcast and select which ad products you are willing to sell. AdvertiseCast splits the revenue between themselves and the podcast. Podcasts keep 80% from every sale. Advertisers can order your ad spots – and podcasters have the right of refusal by approving or disproving the order. AdvertiseCast wants to make sure that advertisers are a good fit for your show. Fulfill the ad order as requested and get paid. Podomatic PRO Podcasters have the additional functionality of Stats Verification, which provides potential advertisers with additional information to make ad buying decisions easier. With a Podomatic PRO membership, you get the exclusive option to have your stats in AdvertiseCast validated by Podomatic, increasing your chance of connecting and creating campaigns with advertisers. Patreon provides a simple way for podcasters to monetize their podcasts. Podomatic helps podcasters reach an audience with free podcasts, customizable embedded players, and promotional tools. The two companies have partnered – and the outcome could benefit podcasters. Patreon is integrating with Podomatic so that podcasters can easily monetize their business and build a closer network with their fans. If you want to make use of this integration you need to have a Patreon for your podcast and have your podcast on Podomatic. After that, all you need to do is put a Patreon button on your Podomatic profile that links directly to your Patreon page. You can do this by clicking on the “funding” tab in your Podomatic settings and adding the link to your Patreon page. The purpose of this integration is to make it easy for your followers on Podomatic to see how they can contribute more to your work. A listener who is already looking at your podcast’s page on Podomatic can click a button and go right to you Patreon. That’s quicker and easier than if they had to go searching for your Patreon themselves. It should be noted that podcasters can use Patreon without using Podomatic, and can use Podomatic without using Patreon. The partnership between the two companies could be beneficial for podcasters who are already using both services, or who are using one and were considering using the other as well.